The eye needs tears to stay healthy. Tears keep the eyes clean of debris and reduce the chance of infection. A poor diet, lack of sleep, hormonal changes and exposure to irritants can reduce your eye's natural lubrication. You can battle dry eyes and the accompanying irritation with herbal remedies. Dry eyes can be a result of constant computer usage, environmental irritants, autoimmune disorders such as lupus or diabetes, taking diuretics that dehydrate the body or hormonal imbalances brought on by menopause. Dry eyes may also be caused by a diet low in omega-3 fatty acids, which are found in walnuts, salmon and tuna but are also found in several plants. Dr. Carol Boerner studied 200 of her patients for three years and found that a daily dose of 2,000 mg of omega-3-rich flaxseed oil reduced incidents of dry eye by 85 percent. Flaxseed oil is available in capsules or liquid form and is taken orally, never applied directly to the eye. In Traditional Chinese Medicine, according to nurse practitioner Marcelle Pick, the eyes suffer and develop symptoms such as dryness when toxins overrun the body. Teas made from chrysanthemums or ligustrum help the liver do its job of clearing toxins from the bloodstream. 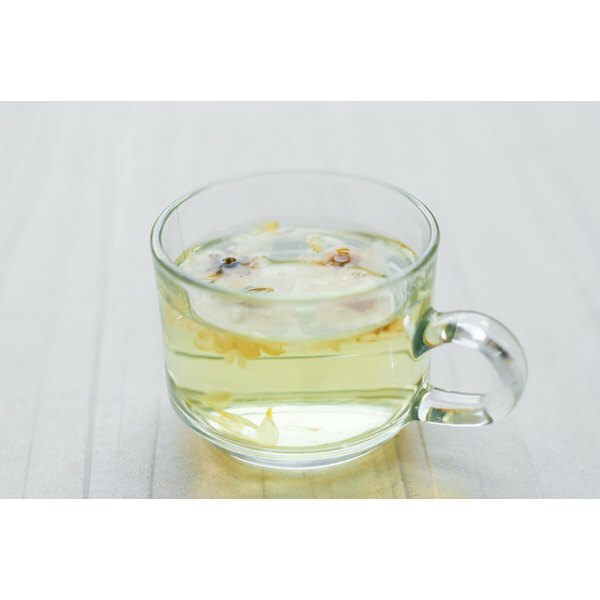 Chrysanthemum tea is made from its flowers. Ligustrum, also known as wax privet, is related to the olive tree that has dark green leaves, small, creamy white flowers and purple berries. It can be ingested as a supplement, with a dose of 5 mg two to three times a day. The seeds of the evening primrose are high in lineolic acid, a fatty acid not produced by the body. In a 1980 study of patients suffering from dry eye syndrome, a regimen of 500 mg daily resulted in substantial improvement for 10 of 17 patients in the study. Eyebright is a plant from the snapdragon family. It can be used to make a tea and ingested, but another use is as an external wash. AltMd.com warns to take care when using it as an internal wash because of the risk of infection. As a tea, drink 2 to 3 cups, two to three times daily.